Here is a cover I found recently in a dealer's stock. 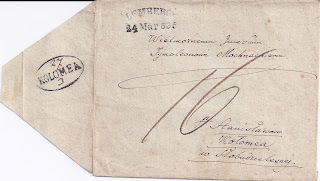 Unusually for this period, the LEMBERG cancel includes the year and not just the day and month - so it reads 24 Mar 835. So we know that this KOLOMEA cancel with "27" and "3" added in ink was in use in 1835. I haven't seen it before and I guess it is rare ... but I don't have a Handbook of Austrian postmarks to tell me how rare.